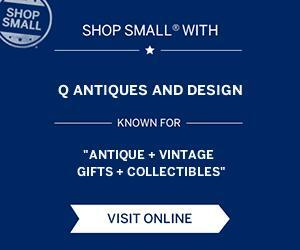 Q Antiques and Design is proud to take part in Small Business Saturday, and we’re encouraging everyone to Shop Small® on November 24th. Plus, we’re having a special Small Business Saturday offer! Visit us on November 24th and you’ll get 10% off all purchases + free domestic shipping, just enter promo code SMALLBUSINESS10 at checkout.